The favored Hillaby won her first stakes easily in Sunday’s Grade 2, $232,000 Bessarabian, giving trainer Mark Casse a sweep of the two weekend stakes at Woodbine. 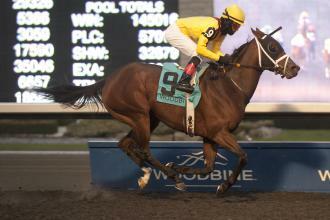 Hillaby strengthens her credentials as Canada's top female sprinter by winning the Bessarabian under Patrick Husbands. Hillaby commenced a three-wide rally from third on the turn in the seven-furlong sprint for fillies and mares. She caught pacemaker Cryptic Message early in the stretch, before coasting home on top by 2 ¾ lengths over Disco Barbie, in a quick final time of 1:21.44. Hillaby ($7) earned $144,000 for Stonestreet Stable, which purchased her for $500,000 at a dispersal sale in July. She is a leading contender for Canadian champion female sprinter honors this year. Sky Treasure finished third for Casse, who also won Saturday’s South Ocean Stakes with Galina Point. Silent Star wound up fourth, in a field reduced to 11 after the scratch of Pirate’s Trove.